Many people attended the Annual Vigil Mass hosted by CatholicCare’s HIV/AIDS Ministry at St Francis’ Church, Melbourne on the eve of World AIDS Day. 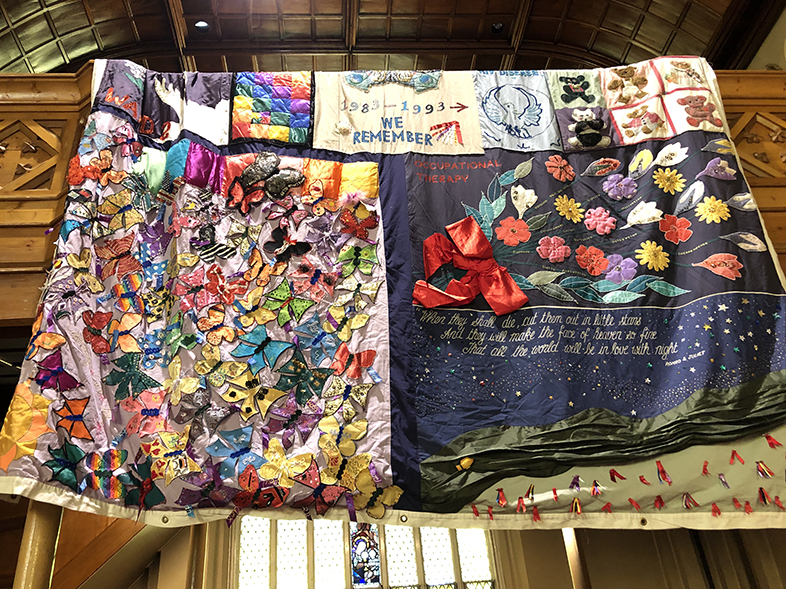 The service was celebrated by Fr Ben Ho SSS and featured the display of a quilt panel from the Australian Memorial Quilt, commemorating loved ones who had died. Each year on 1 December, World AIDS Day is held to raise awareness of HIV and AIDS. It is an opportunity to show support for those living with the virus and to remember those who have died. 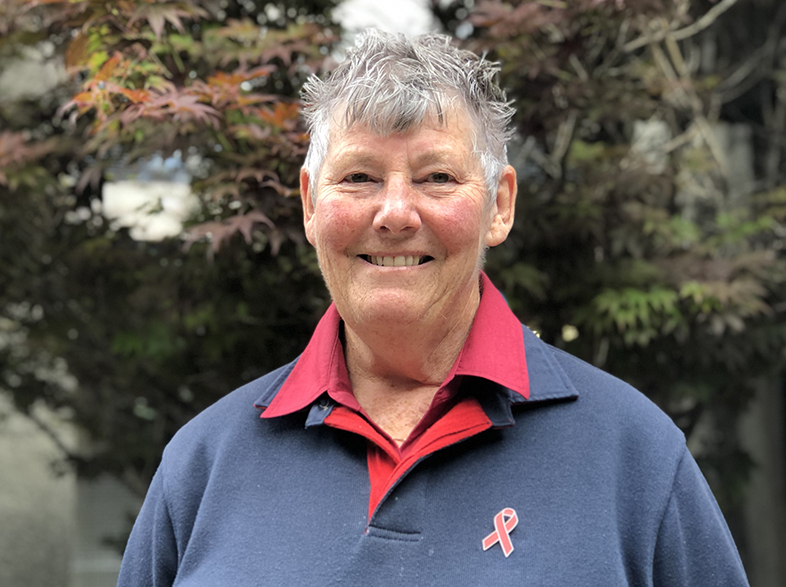 This year, the theme for World AIDS Day in Australia is ‘Everybody Counts’ – a theme that resonates strongly with Marg Hayes, Coordinator of CatholicCare’s HIV/AIDS Ministry which provides pastoral support and hosts a weekly lunch for people living with HIV. The weekly lunch has been running for 15 years, since 2003. In the last financial year, the lunch was attended by 375 people – proof that despite the advances in treatments available, there remains a need for social supports for those who are experiencing discrimination and isolation. In Australia, it is estimated that over 27,000 people are living with HIV and we are fortunate to be one of the countries that is on track to meet the 90-90-90 target set by the Joint United Nations Programme on HIV/AIDS (UNAIDS) which would see 90% of HIV-positive people diagnosed, 90% of those diagnosed receiving treatment, and 90% of those treated achieving viral suppression by 2020. Many countries have not been as successful, as Marg learned at the International AIDS Conference held in Amsterdam earlier this year. As part of the conference, Marg presented at the Catholic HIV and AIDS Network with Anthony McCarthy who was previously a member of the HIV/AIDS Ministry team. Their presentation focused on their best practice approach to supporting people living with HIV/AIDS: a response which provides practical, spiritual and emotional support to help improve wellbeing through hospitality and care. One example of hospitality and care is the annual retreat where participants can kick back, recharge and connect with others. This year’s retreat was held in Millgrove with a focus on ‘Who I Am’ – giving participants the opportunity to express and celebrate that they are more than their diagnosis. Marg explains that the theme was inspired by ‘This Is Me’, a song from ‘The Greatest Showman’, the Hugh Jackman movie about P.T. Barnum. The song is a powerful response to the vilification and rejection experienced by Barnum’s band of circus performers. It is the perfect anthem to represent the courage of those living with HIV and the acceptance that they so richly deserve. “Cause we don't want your broken parts"
World AIDS Day is observed in more than 190 countries around the world. Show your support for people with HIV on World AIDS Day by wearing a red ribbon, the international symbol of HIV awareness and support.